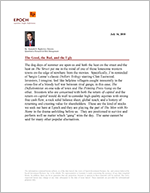 The Good, the Bad, and the Ugly - Epoch Investment Partners, Inc. The dog days of summer are upon us and both the heat on the street and the heat on The Street put me in the mind of one of those lonesome western towns on the edge of nowhere from the movies. Specifically, I’m reminded of Sergio Leone’s classic Dollars Trilogy starring Clint Eastwood. Investors, I imagine, feel like helpless villagers caught innocently in the cross-fire of a bloody turf war between rival gangs; in this case, The Deflationistas on one side of town and The Printing Press Gang on the other. Investors who are concerned with both the return of capital and the return on capital would do well to consider high quality equities with strong free cash flow, a rock solid balance sheet, global reach, and a history of returning and creating value for shareholders. These are the kind of stocks we seek out here at Epoch and they are playing the part of The Man with No Name in the drama unfolding before us. They are positioned to survive and perform well no matter which “gang” wins the day. The same cannot be said for many other popular alternatives. A Fistful of Debt “You see in this world there’s two kinds of people, my friend. Those with loaded guns, and those who dig. You dig”. On one side of town we have The Deflationistas, who certainly make a compelling case: “That which cannot continue on forever must eventually end.” The question, of course, is when. Years of debt piled upon debt brought on by ever expanding entitlements and profligate spending have left the world’s governments with little room for maneuver and almost no fiscal or monetary bullets left to fight another crisis (Figure 1). Total debt levels in the economy have grown to unsustainable levels and must inevitably decline (Figure 2). This global deleveraging effect will depress growth around the world making the debt burden weigh even more heavily. The danger is that this will turn into a dark spiral, plunging the world into another great depression. For a Few Trillion Dollars More Marisol: “Why do you do this for us”? Man W/No Name: “Why? Because I knew someone like you once and there was no one there to help.” On the other side of town, the head of The Printing Press Gang, Fed Chairman Ben Bernanke, has spent his entire career preparing to fight The Deflationistas. A student of the policy mistakes that led to and prolonged the Great Depression, he has committed the Federal Reserve to counteracting the forces of deflation. Having pegged the fed funds rate to essentially zero, he expanded the Fed’s balance sheet throughout the financial crisis to unprecedented levels (Figure 3). This is precisely the playbook he laid out in his famous 2002 “Helicopter” speech. To combat a falling velocity of money, a fire hose of liquidity has been turned on resulting in a skyrocketing monetary base (Figure 4) and a yield curve at historic spreads (Figure 5). This has resulted in a de facto bank robbery of the earnings on household savings (zero percent interest on approximately $7.8 trillion of household deposits over 18 months) in order to help the card sharks of the financial system earn their way out of trouble. The worry here is that upon vanquishing The Deflationistas, The Printing Press Gang will run roughshod over the economy resulting in uncontrollable inflation. The Good, the Bad, and the Ugly The Rojos on one side of town, the Baxters on the other, and me right in the middle. The quote above, which comes from ‘A Fistful of Dollars’, is for me the most memorable from the three movies. I find it memorable not because it is the most clever or most humorous, but because I find it the most applicable to life. Often in life we find ourselves caught between strong forces that seek to pull us in one direction at the expense another. Many times the safest place to be is right in the middle, playing one side against the other. The “good” middle in this case is an investment that will have an attractive risk and return profile in both a deflationary and an inflationary environment. At Epoch, our process is to find and invest in companies with strong free cash flow, a rock solid balance sheet, global reach, and a history of returning and creating value for shareholders. Currently, cash as a percentage of assets for nonfarm, nonfinancial corporate business is at its highest level in fifty years (Figure 6). Furthermore, the earnings yield on stocks verses the yield on comparable bonds is at historically high levels implying that stocks are cheap relative to bonds (Figure 7). In a deflationary environment, these levels of cash and cash flow serve as an anchor to valuation and allow strong companies to increase their competitive position by aggressively taking market share away from weaker rivals while buying up valuable assets at bargain prices. The Printing Press Gang advises you to put your money into commodities in preparation for the coming inevitable inflation. In the same vein, The Deflationistas look to bonds as a haven against inevitable deleveraging and deflation. The problem is that commodities are “bad” investments in a deflationary environment while bonds are an “ugly” investment in an inflationary one. In an uncertain world, high quality equities sitting in the middle are a better choice. March With Hope Track 2: Music From ‘The Good, The Bad, and The Ugly’ & ‘A Fistful of Dollars’ & ‘For A Few Dollars More’, Performed by Hugo Montenegro and his Orchestra, Composed by Ennio Morricone The global economy is a surprisingly complex system. The path it follows is never simple and rarely expected. Uncertain markets like the ones we have today are as disheartening to investors as being trapped between two warring gangs in a lonesome western town. As the stakes have been raised and the conflict become more violent, a fog of volatility has descended over the town making it impossible to know which side, if any, will carry the day. High quality corporate equities of the kind in which we invest at Epoch—names like Exxon Mobil, Johnson & Johnson, Nestle, and Waste Management—offer a way to ‘march with hope’ in the middle, offering protection from The Deflationistas on the one side and The Printing Press Gang on the other.